Sue & Gareth Preece, 47 High St.
Llys y Coed (Palace in the Woods) was reputedly built from stone ‘acquired’ from the grounds of the Cathedral in 1834. In contradiction to its name, the small cottage is no palace and does not lie in a wood but is situated on the High Street and originally formed part of the Grove Hotel grounds. During its history, the building housed a school for the Cathedral choir in the 1800s and, in the early 1900s, the charabanc used by the Grove to take passengers to and from the station in Haverfordwest. It was then used as a garage before being turned into a dwelling in the 1930s (during renovations in 2002 the filled in garage inspection pit was exposed in the living room!). Llys y Coed has been in the same family since 1920 when Martha Ann Richards (Mam Grove), who had been tenant licensee for 10 years, bought the Grove Hotel and surrounding outbuildings and land. She and her husband, along with their 4 daughters ran the hotel until 1960 when it was sold, but Llys y Coed and neighbouring Grove Cottage remained in the family. The circular front lawn is partially inset with slabs to allow easy access to the beds and seating area. The planting consists predominately of bulbs and perennials, with a few shrubs and there is a small rockery. The design attempts to make it attractive to view from the street while also having focal points from the path into the garden and from the seating area. 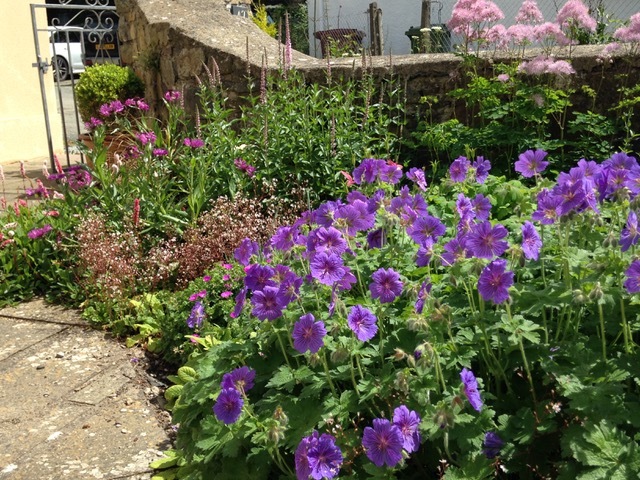 Because of its location, it takes twice as long to care for than the back garden as locals and visitors from all over the world stop for a chat and ask about the plants. Gareth insists that they stop to admire his lawn but the real attractions are the Arum lilies, Camassia, Geraniums and Thalictrum. The rear garden in entered through a wooden arch covered with a vigorous rambling red rose (bought as a bare root cream rose which turned out to be a lovely ‘mistake’). There is a small teardrop shaped lawn surrounded by gravel path and flower borders, with a seating arbour and small patio at the west and east ends to catch the morning and evening sun respectively. 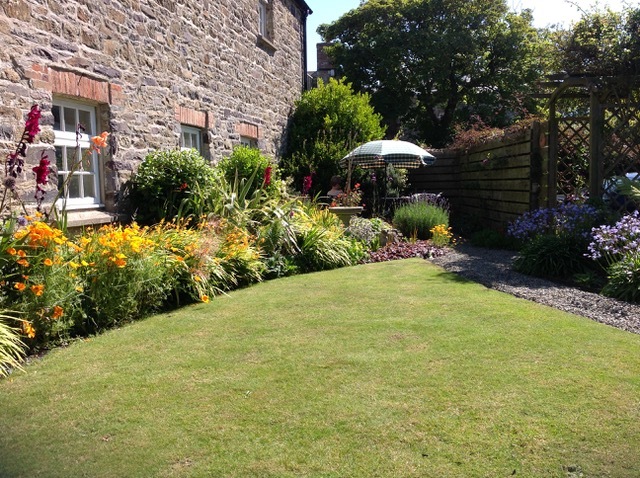 Planting in the rear garden is more of a challenge because the area immediately behind the house in full shade and the bed along the back is in full sun with heat and wind reflected off the tall stone building behind. In spite of attempts to improve the soil, it is still poor and full of broken glass, large pebbles and coal (courtesy of the Grove’s various business enterprises over the years). A disused water tank has been made into a small water feature and a Wormery provides good quality compost and liquid feed. 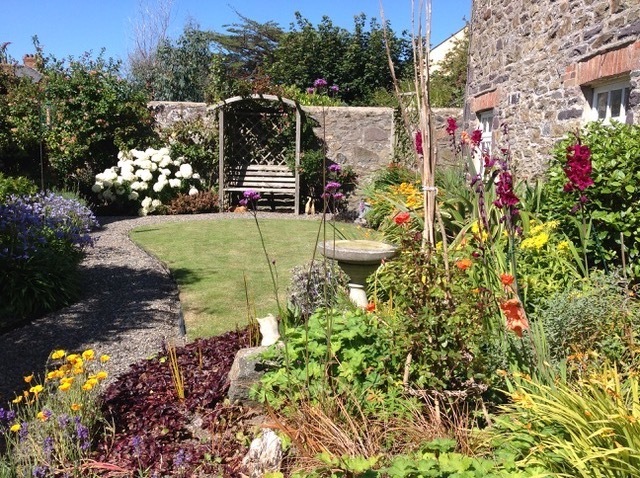 The garden with its birdbath and feeder, and bug hotel attracts a number of small birds, dragonflies and insects. Plants for Sale – plants propagated from the garden – all takings in aid of Prostate Cymru. Seating – front and rear. Access – 3 steps up to the rear garden but can also be viewed from a narrow path that runs alongside the house. 1 very shallow step down to the front garden but can also be viewed over the walls on 2 sides.